The City of Twin Oaks will host the next Membership meeting on Thursday September 27 at their new Town Hall located at 1381 Big Bend Road, Twin Oaks, MO 63021; ( MAP ). 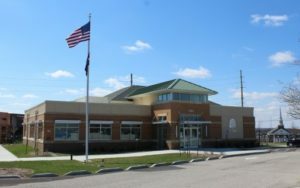 The City Hall is located on the northeast corner of Highway 141 and Bib Bend, in the Schnuck’s Shopping Center. Program: In July of 2017 China announced it would stop importing most recycled plastic and paper from the United States and in August Resource Management here in St. Louis to announced it would stop processing residential single-stream recycled materials after October 31, 2018. These actions are forcing municipalities to evaluate the future of their recycle programs. Brent Batliner, GM of Republic Services Recycle Facility, and Stephen Herring, Manager of Recycling, will discuss the future of recycling in our region. They will talk about what municipalities can do in the short-term and long-term to sustain their recycling programs. The Municipal League of Metro St. Louis hosted an informative presentation on Missouri’s Proposition D, a measure for a ten-cent fuel tax increase to fund state law enforcement and maintenance for highways, bridges, roads, and streets. The meeting was held at the Maryland Heights Community Center where more than 125 people attended. Entering its 15th year in 2018, the Fundamentals of Planning and Zoning Chancellor’s Certificate has educated hundreds of members of the St. Louis planning community. Fundamentals of Planning and Zoning is taught by a team of senior practitioners, who have extensive knowledge and experience in local government planning in Missouri, Illinois and across the nation. Course modules cover planning practices, processes and topics that are crucial for local government success. The Certificate consists of seven modules that include lecture and discussion. Participants will earn a noncredit UMSL Chancellor’s Certificate in Fundamentals of Planning & Zoning by completing six of the seven modules. Here is the information for the 2018 program. If you have any questions, please contact Frank Johnson at frank.johnson@ewgateway.org or 314-421-4220. Registration is now open for the 2018 Chancellor’s Certificate in Fundamentals of Planning and Zoning! Click here to register for the Entire Session, or for Individual Sessions. There were 27 grant applications submitted in Round 19 which closed on August 31, at 4:00 PM. The Park Commission has allocated $6.6 million, the total amount requested was $8.9 million. 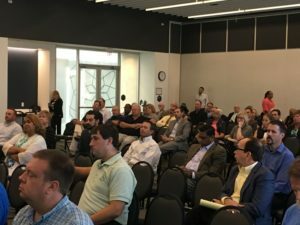 The Commission Advisory Board, led by Des Peres Parks Director Brian Schaffer is scheduled to meet on September 21 to review and score the applications. The Advisory Board recommendations will be presented to the Park Commission on October 12 for final approval. It is anticipated that the the agreements for the approved grants will be mailed out in early November. The Municipal Park Grant Commission is accepting applications for quarterly planning grants. The applications are available on the Commission website, www.muniparkgrants.com. Applications are due by October 5, so that they can be reviewed by the Commissioners at their next meeting. Planning grants can be used for park master plans, master plan updates or for specific park projects. Cities are eligible for up to $6,400 and are required to match at least 20% of the planning cost. Cities can apply for planning grants annually. Having current, updated planning documents, cost analyses and public input increases the chances for receiving park construction grants. If you have questions about the Planning Grant applications, please contact the Municipal League office. The Legislative Affairs Committee reviews and updates the League’s legislative policy statements and recommends the legislative priorities for the upcoming session. The policy statements and priorities help facilitate the flow of information between our members and the State Legislature. The committee helps identify opportunities to increase the level of interaction flowing from our members to our legislators, and a reciprocal flow of information from our legislators to our members. The first meeting is scheduled for September 15. If you have suggestions for policies for the committee to review, please contact the League office at staff@stlmuni.org. Collection of internet sales tax following the U.S. Supreme Courts ruling overturning the previous court decision in 1992. HB 2242 Missouri Municipal Government Expenditure Database. The entire legislative packet will be submitted to the membership for approval later this fall. For comparison, the seasonally adjusted U.S. unemployment rate was 3.8 percent in May. Missouri’s unemployment rate has now been below the corresponding U.S. figure for 37 consecutive months. Missouri nonfarm payroll employment changed little in May, the second straight month to show relatively flat employment. Total nonfarm payroll employment was up by 400 jobs, following a 500-job gain reported in April. Gains and losses were reported in individual industries in May. Private service-providing industries reported a net gain of 1,100 while manufacturing showed a net loss of 1,900. Local government employment was up by 1,000 in May. Over the past year, total nonfarm payroll employment in Missouri has grown by 34,300 (+1.2%). Professional and business services employment added 12,500 jobs over the year, with health care and social assistance adding another 8,000. Trade, transportation, and utilities employment was up by 6,900 jobs over the year, while construction employment was down by 1,500. Two smoking ban measures will be on the November 6 ballot. One, sponsored by the Health Coalition would eliminate exemptions for casinos and more than 90 bars allowed under the county’s current seven-year-old smoking ban. The Health Coalition plan also would get rid of other exceptions for nursing homes, cigar bars and up to 20 percent of a hotel’s guest rooms. vaping, also known as e-cigarettes, would be banned from indoor public places as well. The second measure sponsored by the owners of the Hollywood Casino in Maryland Heights, would allowing smoking in half of a casino’s gaming areas. In St. Louis County if two ballot measures with conflicting provisions are both approved by voters, the one getting the most votes prevails. St. Charles County residents will also be voting on competing smoking ban propositions; currently St. Charles County does not have any laws restricting smoking.